I would like to formally thank you for the incredible tease that you laid upon our wonderful city this week. You showered us with mild temperatures, sunshine and the smell of dog crap spring in the air, and then proceeded, as you often do, to throw upon us a blanket of snow, slush and cold. What gets me through winter in times like these? Two things: The Nuit Blanche festival, and good food. As I prepared myself to spend a night prancing around in the snowy abyss that our city has become, I decided that the best way to begin would be by indulging in a little bit of comfort - food, that is. I'm not talking Kraft Dinner (that was Wednesday), and I'm not talking grilled cheese - I'm talking about something real, something with substance, and something that will keep me satisfied. I now present to you my favourite appetizer of all time. Coat a medium sized frying pan with olive oil. Add butter and mushrooms. 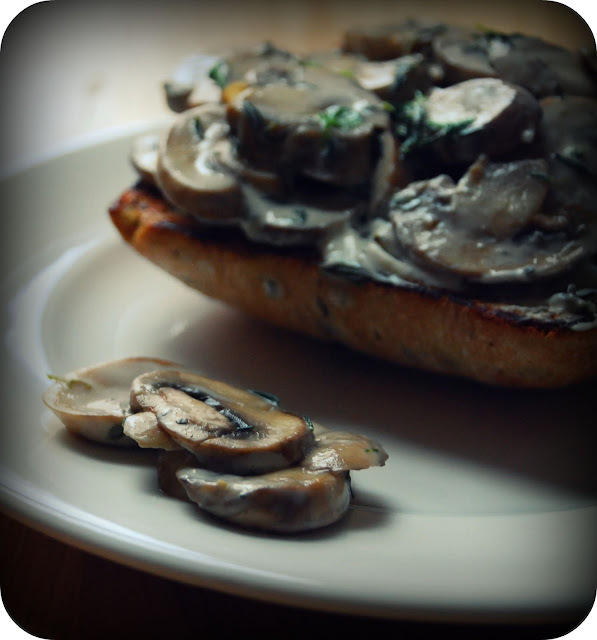 Sauté mushrooms and thyme on LOW heat until softened, continuously stirring with spatula. While mushrooms are cooking, toast bread. Stir 2 tbsp cheese into softened mushroom mixture, tossing to coat. Spread toast with remaining goat cheese, and top with mushroom mixture. Enjoy! Will definitely try this one!! looks so yummy. Looks absolutely delish, mushrooms w/goat cheese! Definitely trying this for sure! PS - Thanks for commenting Deb! !